Built in the 17th century, the Church and Monastery of the Reformed Franciscans is not one of Kraków's oldest. But Reformacka street, with its tall walls of the Monastery and its Station of the Cross painted by Michał Stachiewicz is one of the most beautiful nooks of Krakow. For almost two hundred years, the catacombs underneath the Church and the Monastery served as a burial site. Over one thousand bodies lie here: those of monks, inhabitants of the city and members of important families. There are sarcophagi, crypts, coffins and bodies of monks lying directly on the sandy floor. 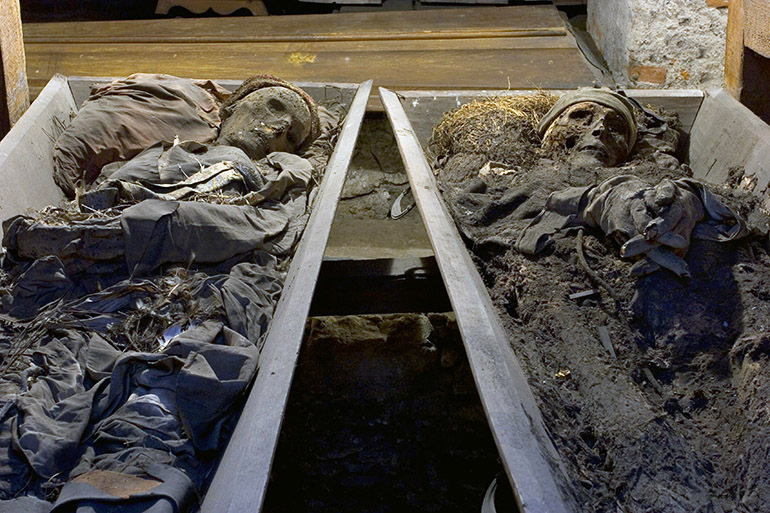 The rare microclimate preserved the mummified corpses. In 1812 a soldier in Napoleon's campaign who died in Kraków after the long march back from Moscow was buried here. Mysteriously, the unnamed soldier lies next to Countess Domicela Skalska, who after giving all her money to the monks, requested them to bury her next to the soldier. The crypts are open to the public just once a year, on All Souls' Day (2 November).